On Monday, October 8, 2012, President Barack Obama arrived in California to deliver a thirteen minute speech at Villa La Paz, the burial site of Cesar Chavez, the pioneering United Farm Workers (UFW) organizer and icon of the farmworkers’ movement. Crowds of hundreds inundated the searing Central Valley as they lined up excitedly and patiently waited to be allowed inside. The program commenced as Arturo Rodriguez, current president of the UFW, introduced President Obama who approached the podium with the phrase “Sí se puede”, “Yes, we can.” Obama opened his presentation thanking all of the Democrats who assisted throughout the project and contributed to the establishment of the Chavez monument. We are certain that Cesar Chavez turned over in his grave when, in a rushed mumble of an introduction, Obama awkwardly thanked Governor Jerry Brown. This same Governor Jerry Brown (D-CA) vetoed a series of pro-migrante and pro-worker legislation days before with a cold stroke of a pen, on Sunday September 30, 2012. In an 11th hour decision shamefully carried out in in the dark of the night and hidden from the public, Brown vetoed bills that would have brought minimal protections to the state’s most vulnerable population: undocumented and working-class Raza of California. The governor dared not host a large daytime press conference, fearing what he would have undoubtedly faced–an outpouring of rage from the public. The bills vetoed by the governor had attempted to ensure basic reforms to agricultural and domestic workers’ rights. One such bill, the Domestic Workers Bill of Rights AB-889, aimed at providing overtime pay, meal and rest breaks, as well as adequate sleeping conditions for live-in workers (including house-keepers, child-care providers, and caregivers). Other bills blocked by Brown, SB-2346 and AB-2676, aimed at ensuring that campesinos obtained the right to sue employers and would make it a criminal misdemeanor punishable by jail, including fines of up to $200,000, if employers failed to provide access to water and shade for farm workers across California. A fourth bill, AB-1081, known as the TRUST ACT, aimed at restraining the infamous (In) Secure Communities Program (S-COMM) by curbing indiscriminate “detainers,” of undocumented individuals who were suspected criminals, at local city or county jails. Despite massive state-wide pressure from grass-roots organizations, moderate political forces, as well as several supportive law enforcement agencies, the TRUST ACT was vetoed by Brown. In various counties across the state community and activists mobilized in an attempt to publicize before state-level legislators, that local police collaboration with S-COMM has continually terrorized migrante communities and led to unjustifiable separation of families. For example, Los Angeles Assemblyman Gil Cedillo—despite being a ‘co-author’ of the TRUST ACT—rather than actively support the TRUST ACT, opted to concentrate the end of his term on advocating for a limited-scope “Driver’s License Bill”—a bill that would grant licenses for students and youth who qualified under Deferred Action (DACA). However, even organizing leaders from the Dreamers’ movement have identified Cedillo’s bill as a ‘fake’ and empty bill, since these students would already have access to drivers’ licenses without the pathetic handout that the Democrats, including Cedillo and Brown, tossed at our community with this bill. 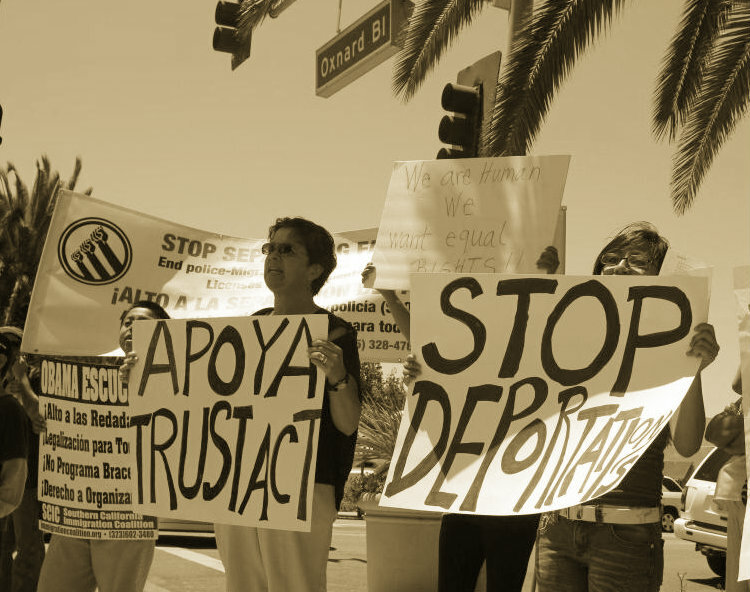 Another example is the struggle that took place in the central coast, during which community and activists organized on the streets to pressure Assemblyman Das Williams (34th District) of the Ventura/Santa Barbara County region to support the TRUST ACT. Not until there were amendments that included the ability for local law enforcement to detain ‘suspected criminals’ (read: Not tried or convicted) did Assembly Williams finally voice support for the watered-down version of the TRUST ACT. In the end, Governor Brown sustained his support for the prison/detention/mass-incarceration industrial-complex and with the Department of Homeland Security – Immigration and Customs Enforcement (DHS-ICE). As of August 22, 2012, the ‘Secure Communities’ project has nearly reached full ‘jurisdiction Activation’—with 3,074 out of 3,181 jurisdictions (97%) and 58 out of 58 (100%) jurisdictions in California. This allows the ENDGAME mass deportation mandate to establish the infrastructure and all resources needed for “removing all removable aliens.” We can only expect rapid acceleration of the amount of deportations through poli-migra based operations, sweeps, etc. The worksite E-Verify documentation inspections or ‘silent raids’ will continue as will the militarization of the U.S./Mexico border and our communities in general. Despite a glimmer of hope for the passage of the TRUST ACT, most—especially independent community resistance forces—were prepared for the worst. History has taught us that we cannot solely rely on politicians to act in defense of our communities. During Obama’s 2008 bid for presidency, many pinned their hopes on the Democratic Party’s promises of reigning-in a so-called “Comprehensive Immigration Reform.” Yet four years later, the president has earned and surpassed his title of Deporter-In-Chief, breaking historical records by deporting 400,000 undocumented workers annually for the past two consecutive years. “We must always practice accountability to the communities we serve. The Todo Poder al Pueblo Collective is a community-based and Action-oriented group organizing demonstrations, fundraisers, workshops and trainings. Whenever possible we will network, collaborate, and dialogue with allied organizations on the basis of principled unity. While we welcome strategic engagement with lawmakers and public officials, our demands for justice can only be won if they are backed by an organized social force working tirelessly and deliberately to secure meaningful change. Engagement and communication with those forces that oppress and attack our community are inevitable – but our dignity is non-negotiable. It is clear now more than ever that, as difficult as it may seem, we must take on this obligation. We, the people, will build our own capacity to defend ourselves outside of the grip of the status-quo party establishment. This means working independently of the Republicans and the Democrats. Not only have the politicians from these parties turned their backs on our communities, but they were never walking with us to begin with – unless it was to advance their own careers. Helen Chavez and our community should have never let these opportunists in!